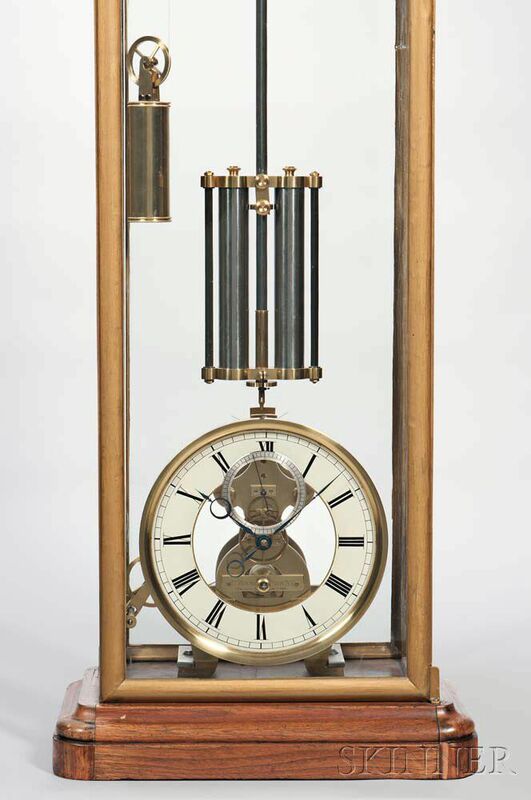 Charles Fasoldt's Patent Inverted Dial Regulator, Albany, for H. Eckert, Troy, New York, c. 1865, gilt-iron and glass case with full-length glass doors front and back, the front marked in gold leaf Observatory Time, capped top and bottom with molded walnut cornice and base trim, the top with wooden box protecting the pendulum T-bridge suspension, the roman numeral glass dial mounted in the lower section with clear center, silvered seconds dial and brass bezel all mounted to the four-pillar, shaped plate movement marked on the front plate great wheel bridge H. Eckert Troy N.Y./C. Fasoldt's Patent March 7, 1865, eight-day duration with current three-pulley configuration, maintaining power, five-wheel train, the escape wheel arbor with two fifteen-tooth escape wheels, impulse fork with rollers, two-jar mercury temperature-compensating pendulum with steel rod, all powered by a three-pulley configuration and cylindrical brass weight, ht. 56 3/4 in. Note: Charles Fasoldt (1819-1889) was born in Dresden, Germany. 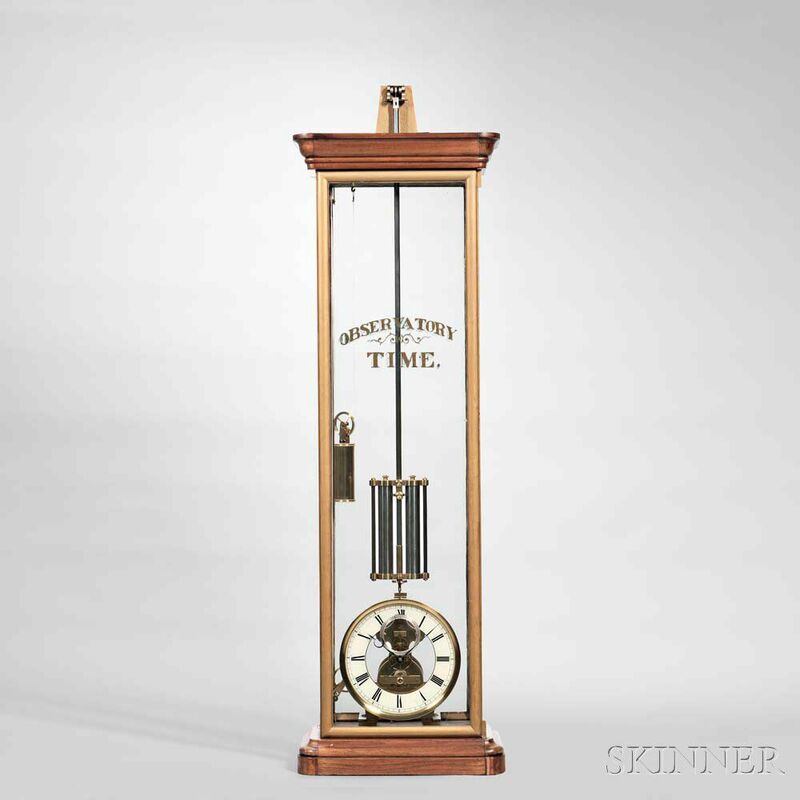 By the mid-19th century he settled in Rome, New York, practicing the watchmaking trade, one in which he was particularly skilled. 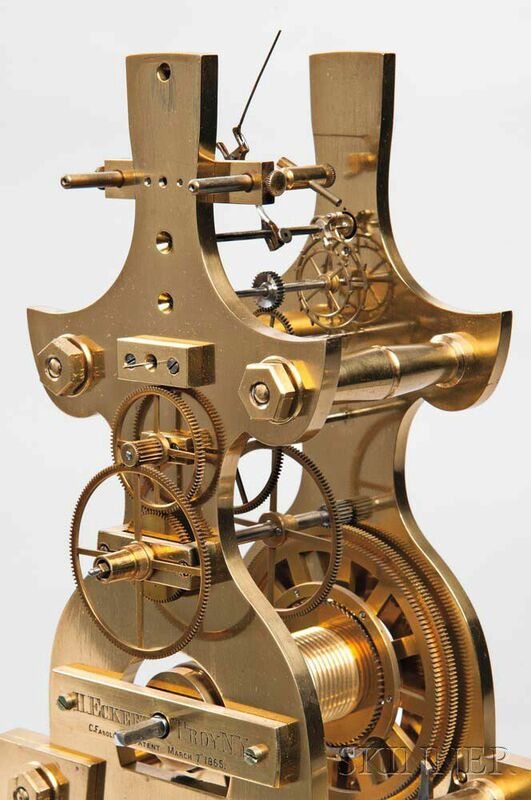 Fasoldt manufactured, exhibited, and won prizes for his eight-day watches, regulators, and pocket chronometers. 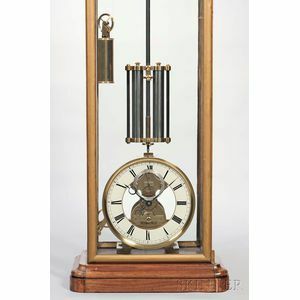 After a move to Albany about 1860, where he manufactured award-winning tower clocks and astronomical regulators, he is credited with inventing a "peculiar double wheel escapement called 'Fasoldt's Chronometer'" (Derek Roberts, Precision Pendulum Clocks, France, Germany, America, and Recent Advancements, p. 208). Conservation/restoration report dated March 3, 1997 by Richard Ketchen available on request.